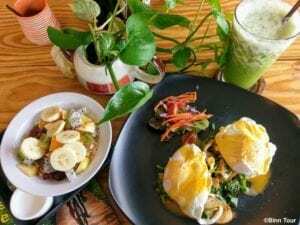 Where can I get the best breakfast in Bangkok? Breakfast buffets in 5-star hotels in Bangkok are usually very good. The Siam Kempinski hotel makes no exception and provides two different dining areas. While you have the same choice of food, the dining hall in the West wing feels less crowded. 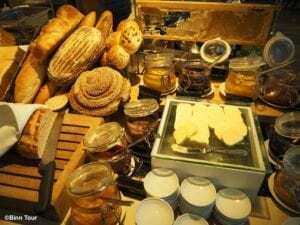 The breakfast buffet at the Brasserie Europa is one of the priciest in Bangkok, but it comes with some delectable highlights. The spread has a great variety and some additional dishes are available à la carte (the poached egg with Hollandaise sauce and truffle is absolutely worth trying!). The price for the breakfast buffet is 890 Baht for adults (plus tax and service) and 445 Baht for children between 6 and 12. The Siam Kempinksi hotel is right behind the Siam Paragon shopping mall and so easy to reach from the BTS station Siam. Serving a Western-style breakfast and brunch, Café Tartine draws in a foreign clientèle. It is known for homemade bread and pastries. There aren’t many places in Bangkok where you can get a decent croissant. 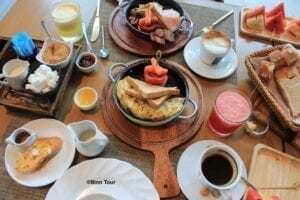 Moreover, you can get a great deal in the morning, which includes any kind of coffee, one croissant and orange juice for 99 Baht on a first come, first served basis. The menu also has a good variety of sandwiches, salads and quiches making this place an excellent choice for lunch. The staff is friendly and makes an effort to reduce plastic waste by supporting the “Skip the Straw” campaign. The French café is located in Soi Ruam Ruedi and only a short walk away from Phloen Chit BTS station. 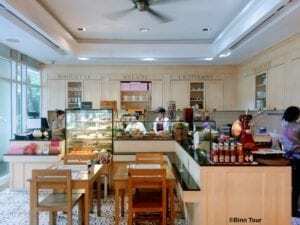 Crêpes & Co combines good food and service with a friendly and bright ambience. High ceilings and an elegant decor will make you feel instantly comfortable. Going beyond their specialty (sweet and savory crepes), Crêpes & Co provides a large menu of tasty food for breakfast and brunch. Ideal for casual dining or a family meal, this place is certainly worth a visit. The restaurant in Thonglor is a long walk from Sukhumvit Road that it makes sense to go there by taxi. However, they have a second location (Crêpes & Co Langsuan) which is in walking distance from Chit Lom BTS station. The MoMo Cafe offers an international breakfast buffet at a reasonable price. A friendly staff will receive you in a spacious dining hall with orange tones and plenty of natural light. 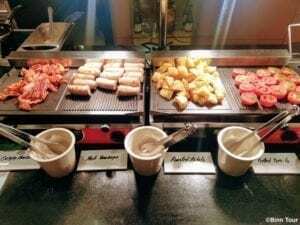 The breakfast buffet costs 450 Baht (plus tax and service) and is therefore one of the more affordable ones in a hotel in Bangkok. Children under 6 years eat for free and those between 6 and 12 get a 50% discount. The breakfast buffet is served daily from 6 am to 10.30 am. It’s also possible to order a continental or American breakfast à la carte starting at 320 Baht. The MoMo Cafe is located at the Courtyard by Marriott less than a 10-minute walk from the BTS station Ratchadamri. On Lok Yun is one of the few cafés in the Old Town district that serves an international breakfast. It opened more than 70 years ago and is popular among locals and foreign visitors. On the Thai and English menu you can find fried eggs with sausages, ham and bacon. However, the real highlight is the Thai breakfast with homemade bread, sugar and jam. The portions are small, but so are the prices (22 Baht for a coffee) that you want to try out several things. Because the restaurant has an open front with no air conditioning, I recommend coming early in the morning when the temperatures are still tolerable. 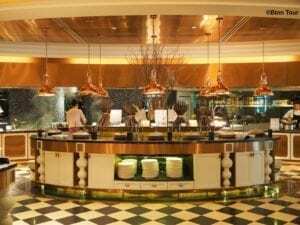 Guests and outside visitors at the 5-star Plaza Athenee can expect a sumptuous breakfast buffet at the hotel’s Rain Tree Café. Set in an elegant and spacious dining hall, the buffet’s international food will leave no unfulfilled wishes. Next to a Western spread, you can find Japanese, Indian and Thai food. Be sure to stop by at the juice bar where you can choose the fruits and veggies to go into the juice mixer. The fresh coconuts and delicious sorbets are just some other highlights. The price for the breakfast buffet is 750 Baht (plus tax and service) and 375 Baht for children between 6 and 12. Reservations are recommended, but usually you can just walk in. The Rain Tree Café is located on Wireless Road and the Skytrain (BTS Phloen Chit) is just around corner. The Unnamed is one of those places where visitors gladly come back for their daily coffee and breakfast. It gets to the point where some are greeted with “The same as always?”. The small and cozy café is run by two sweet ladies and serves just about everything that makes you crave in the morning: French toast, crepes, pancakes, you name it. Try their Eggs Benedict along with a green smoothie and you will be fueled for the day. Everything is freshly made. And since there are only two persons preparing and serving the meals, it’s better not to be in a hurry. The Unnamed is open Tuesdays to Sundays (7 am to 4 pm) and very close to the BTS station Chong Nonsi.